Underdog Eagles Pull Out A Shocker, Beating Patriots In Super Bowl LII : The Two-Way It was a slobberknocker all game long, with both offenses dominating. But ultimately, Philadelphia's defense made the crucial final stops that earned the team its first-ever Super Bowl title. 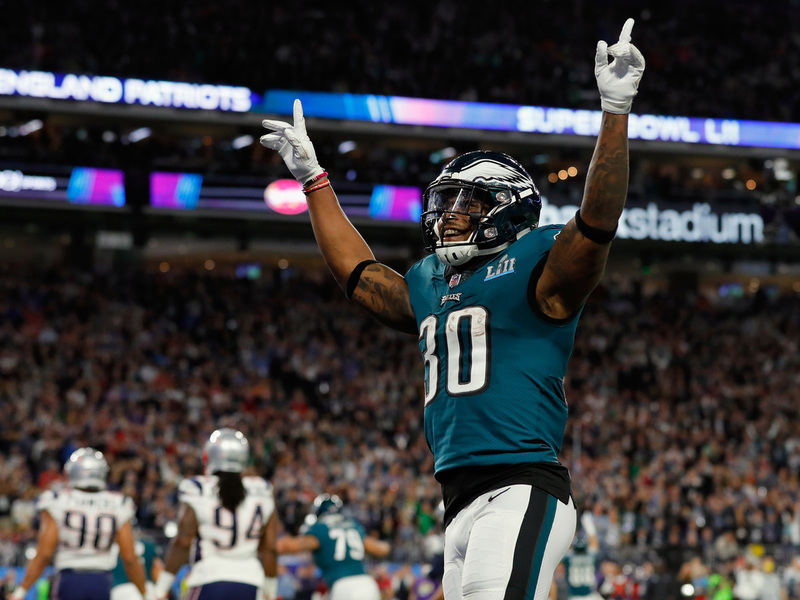 Eagles running back Corey Clement celebrates a touchdown in the first half of Super Bowl LII. You'd be forgiven if you went to bed early having chalked up another win for New England. After all, the Patriots may have been losing to the Philadelphia Eagles with just a few minutes to play — but they had Tom Brady under center, the man who has helmed countless fourth-quarter comebacks, including a rather historic one to win last year's title game. He had thrown for nearly 500 yards and three touchdowns already by this point. Surely this Super Bowl would play out just like so many we've seen before, with Brady steering the Pats down the field to pull out the win — right? It didn't exactly pan out that way. In a slobberknocker of a matchup, with both offenses looking unstoppable for much of the game, it was ultimately Philadelphia's defense that made the decisive plays in the final minutes to win Super Bowl LII, 41-33. First, they forced an uncharacteristic fumble by Brady, then — after a brief drive by Philadelphia — they stopped the Pats again on the last drive of the game. Now, the Eagles are Super Bowl champs for the first time in franchise history. And, in a development that even a psychic would have had a hard time believing at season's start, Nick Foles has been named Super Bowl MVP. The oft-maligned quarterback — who had been a backup riding the pine until a late-season injury sidelined franchise QB Carson Wentz — threw for more than 370 yards and went blow for blow with Brady, arguably the greatest player in NFL history. In fact, it was Foles who connected on the game's final haymaker, hitting tight end Zach Ertz for the go-ahead score with just a couple of minutes left on the clock. But it was far from just Foles who led the Eagles' relentless attack. Rookie running back Corey Clement racked up 100 receiving yards, including a touchdown, while ex-Patriot LeGarrette Blount gashed his former team's defense for 90 rushing yards and a touchdown of his own. The shootout saw both teams combine for more total yards than any other Super Bowl in history. All the while, NPR and member station reporters were covering the action, both on the field and off — and, since poetry mixes well with everything, we mixed in a few #superbowlhaiku contributed by all of you while we were at it. Scroll down to read the latest on our live-blog, or click here and scroll up to relive the dramatic night from the very beginning. James White of the New England Patriots sprints to paydirt for a 26-yard score against the Philadelphia Eagles in the second quarter. After a season defined by disputed calls, it is fitting that a decisive play in the season's final game will — once again — come down to instant replay. But once more, just as with Corey Clement's touchdown earlier, tight end Zach Ertz's touchdown had to be looked at — and ultimately affirmed — by instant replay. That's a huge go-ahead score for the Eagles. It took more than 50 minutes of football, but the New England Patriots have finally taken their first lead of the night on another Tom Brady strike to tight end Rob Gronkowski. And their timing could hardly have been better: Now, with just over 9 minutes left on the clock, the ball is in Nick Foles' hands — and so is the Eagles chance at a championship. Also, remember that missed point-after attempt by the Eagles in the first quarter? That lost point now marks all that separates the Pats from the Eagles at this point, with the game at 33-32. “Football” equals ball meets foot. This game is beginning to resemble a couple of go-for-broke heavyweights, clobbering each other with haymaker after haymaker and little regard for defense. The drives so far this half have been fast, efficient and above all, met with little resistance. Not long after Philadelphia scored, New England double-timed a march back down the field and answered. Within just a few minutes 14 points have been tossed up on the board between them, and both teams have combined for the most total yards in Super Bowl history — already, before we've even gotten to the fourth quarter. And there's no reason to believe the pace will slow anytime soon. Shira Springer of Boston member station WBUR observes there's been a clear enthusiasm gap between Eagles fans and Pats fans in the stadium in Minneapolis. "After every touchdown they're playing 'Fly, Eagles, Fly," she reports. "Between that and the enthusiasm gap, it's beginning to feel a lot like we're playing in Philadelphia, not Minnesota." It wouldn't be a true NFL game without a dispute over what constitutes a catch. In this case, running back Corey Clement just added to his rather impressive Super Bowl performance so far by nabbing a pass in the back of the end zone. It was ruled a touchdown at first — and, after the instant replay appears to show him juggling the ball ... the touchdown still stands. "I give up," NBC announcer Chris Collinsworth said on the broadcast, and he's probably not the only one. But Philly fans would be happy to help explain it to him, one can be sure. WBUR's Martin Kessler reports the Eagles fans around him, while watching the replay from the stands, "chanted 'one! two!' in unison as the receiver's feet touch the ground." "Ire is building online against Dodge for using a speech from Dr. Martin Luther King Jr. in an ad for its RAM trucks," NPR's Eric Deggans notes. "They were going for a poignant plea to show that anyone can be great in America. Instead they snarked off everybody from MSNBC's Joy Ann Reid to actor John Cusack for making it look like our nation's greatest civil rights leader is posthumously shilling trucks." Call that the Gronk Drive. Or, the Rob SlamDunkski. Or, you know, something a little more clever than that. These word-plays can't all be winners. Anyway, tight end Rob Gronkowski dominated that possession, hauling in grab after grab in a fashion that's become familiar for anyone who's seen a Pats game this decade. Still, as expected as dominance may be for the massive pass-catcher, he hadn't had much of an impact in the first half. That's got to change in the second if the Patriots are to manage a comeback — and, after four catches for 69 yards on that drive alone, including the touchdown capping it, it appears Gronk is well on his way to doing so. NPR's TV critic Eric Deggans has some praise (or, perhaps better put: relief) for Justin Timberlake's halftime show, after the pop star decided against his reported plans to bring Minnesota's favorite son, Prince, out on stage as a hologram. Instead, the late great Purple One made an appearance as a projection. "Thank God they didn't do a Prince hologram," Eric tweeted. "And no chance for a wardrobe malfunction with Prince projected onto a large sheet. Still, nice touch." It's halftime. And that means one thing. Well, two things, perhaps: a Justin Timberlake performance, and much more importantly, your haiku. Now that is a playcall. On fourth down, from the Patriots one-yard line, Nick Foles fakes an audible before the snap — and just as he taps on a lineman to change the play, the ball is snapped, the running back gets it, flips to tight end Trey Burton, who lofts a toss and ... well, here's a sentence I didn't imagine writing at the start of the day: Nick Foles caught a touchdown pass. And, in a turn of events almost just as stunning: Philadelphia hit a point-after attempt. I know, your trusty blogger couldn't believe it either. All of a sudden, those underdog Eagles look very much in control. But before they get too confident, they can ask the Atlanta Falcons how much control at halftime helped them. There's still a whole half of football yet to play. "NBC aired 30 seconds of dead air instead of an ad," NPR's Eric Deggans reports. "One of my commenters joked that it was an ad for the Sopranos finale. I could only think 'there goes $5 million out the window.' "
NBC Sports on 29-second cut to black during commercial time in some markets: "We had a brief equipment failure that we quickly resolved. No game action or commercial time were missed." 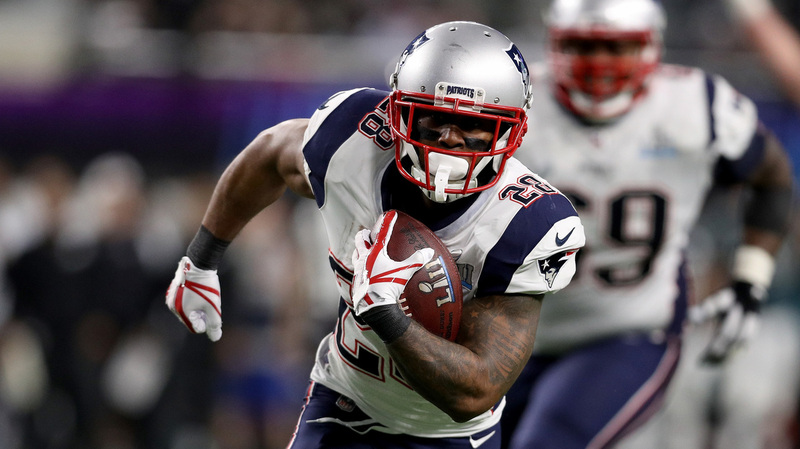 Rumbling, bumbling, stumbling, zigging and zagging — through it all, Pats running back James White somehow stayed on his feet. And good thing he did: Those feet took him to paydirt. It was a play reminiscent of White's spectacular performance in last year's Super Bowl win — and it's that kind of run the Patriots will continue to need to keep pace with this Eagles offense. And then ... well, and then the point-after attempt happened. I'll leave it to the statisticians to decide, but this certainly seems that we're on pace for a record number of missed PATs. Stephen Gostkowski didn't miss on the kickoff, though — the New England kicker took out his frustration with a monster of a hit to put the Eagles kick return to bed. We have our first turnover of the game, folks: In one of those nifty, bobbling plays that appear to have become a Super Bowl staple in recent years, Alshon Jeffery struggles to come down with the ball — and doesn't, batting it into the waiting arms of the Pats' Duron Harmon. That was the first turnover the Patriots have forced since Week 15 against the Steelers. That was also a Duron Harmon interception. Now, the Patriots have it within their own 10. This may very well be the break they needed to begin digging themselves out from this hole before the half ends. The story remains the same for the Eagles offense — and the Pats' defense. Nick Foles and Alshon Jeffery are showcasing an all-but-unstoppable connection, while Philly's running back committee continues to gash this Pats defensive line. Now, LeGarrette Blount has joined the party against his former team: the former Pats running back just scored for the Eagles. To this point, it appears the Patriots are dumbfounded as to how to stop this steamroller of an offense. ... except on point-after attempts, apparently. The Eagles failed to convert their two-point attempt, a bid to get back the point they missed earlier on the missed PAT. No dice on this one either. After taking a massive hit from Malcolm Jenkins, at the end of what had been a huge reception, New England wide receiver Brandin Cooks has been ruled out for the rest of the game with what appears to be a head injury. The hit presented not just a scary sight. It also strips the Pats of one of their biggest pass-catching threats — arguably their second most-important receiver, after only tight end Rob Gronkowski. Hey, remember those Rocky clips our Boston member station colleagues were remarking upon — politely, of course, and without even a shade of indignation? Well, Boston got its moment on the big screen, after all. "We were hoping that it would be a Good Will Hunting scene to pump up the Pats' fans," WBUR's Martin Kessler reports. "But instead it was 'I'm Shipping up to Boston' by the Dropkick Murphys." Another shank on an easy one, this time from New England. After a remarkable tackle brought the Patriots' drive to a fourth down inside the 10, a botched kick attempt means the score is precisely where we left it at first quarter's end. Remember that tally of lost points as the game goes on, everyone: That's one for Philadelphia, three for New England. After one quarter, both offenses are firing on all cylinders: Philadelphia has beaten New England by land and by air; meanwhile, New England has matched them stride for stride on offense. On the goal line again now, the Patriots are poised to even the score — or top it. Remember that missed PAT by the Eagles, after all. Nick Foles delivers a long-range strike to Alshon Jeffery for an acrobatic touchdown catch, from more than 30 yards out. This game almost could not have started any better for Philly, which has dominated on the ground and — as showcased in that TD reception — has shown the Patriots will pay if they start selling out to stop the run. It appears the New England defense is on its heels to begin the game, getting beaten from just about every angle. Now for that almost: The Eagles failed to convert possibly the easiest element of that drive, sending the point-after attempt wide right. Don't be surprised if that lost little point plays a rather big role later in the game. Another solid drive — this time from the Patriots — that ends in field goal. The scoreboard now features a pair of threes after both defenses managed to bend but not break, holding the goal line just when they needed to. Our colleagues at WBUR, the Boston member station, have remarked on the fact that it appears the crowd is a little Eagles-heavy tonight. Lots of green, lots of noise while the Patriots have the ball — and, fittingly, a Rocky montage on the big screen. Because of course. Impressive start from the Philadelphia Eagles. This is precisely how the game must go if these underdogs are to take the reins: long drives, third down conversions — even on third-and-longs — and above all, reliable play from quarterback Nick Foles. So far, they've gotten all three — but they also settled for three on the scoreboard, after the Patriots defense found their spine on the goal line. That field goal gets the Eagles on the board first — now, it's Tom Brady's turn. A helpful reminder from ESPN's Darren Rovell that people will bet on anything. Unofficial finish of P!nk's National Anthem (started at "Oh say can you see...) is ONE MINUTE, 53 SECONDS. Over/Under from @bovadalv was 2 minutes flat. NPR's TV critic will be filling us in on that other main event going on tonight: the Super Bowl commercials. And he opens on a note of togetherness — which you can probably expect from a whole lot of commercials tonight. Watching Mass Mutual commercial telling stories of neighborly togetherness while a group sings "I'll Stand By You." I have a feeling lots of commercials tonight will offer just such a reaction to today's divided times, with few other political statements. #superbowlads. Hey friends, want to tweet some haiku using the hashtag? I could use some help with all this live-blogging stuff. I'll include some of my favorites here as the night goes on. President Trump declined an invitation for a gameday interview, breaking with a recent tradition that dates back to the George W. Bush administration. But earlier Sunday, he still offered a message for the occasion, dedicated to "the brave men and women of our Armed Forces." "We owe these heroes the greatest respect for defending our liberty and our American way of life. Their sacrifice is stitched into each star and every stripe of our Star-Spangled Banner," he said in a statement released by the White House. "We hold them in our hearts and thank them for our freedom as we proudly stand for the National Anthem," he added. The remark appears to refer to players kneeling for the national anthem — a gesture intended to protest police violence in the U.S. Trump has condemned the protest multiple times, including calling on Twitter for the protesting players to be fired. Meanwhile, outside the stadium, another kind of protest gathered. Minnesota Public Radio reports about 100 protesters blocked light rail lines leading into the stadium for about an hour, singing and wearing shirts saying "No More 45: Black Lives Matter." More than a dozen demonstrators have been arrested, according to MPR. And then there were two — and we're not talking about the two teams taking the field this evening. Nope: In this instance, at least, we're talking about a much more pressing numeral: 2 degrees F.
That was what the thermometer was reading outside U.S. Bank Stadium in Minneapolis, even at the height of midday Sunday. It's expected to continue to hover in the single digits throughout the game. All of this sets this game on a course to be the coldest Super Bowl on record. Quartz explains only the Super Bowl game day in Detroit in 1982 had an average temperature anywhere close, at 12 degrees F.
Happily for fans and players, the Minnesota Vikings had the good sense to put their home field under a dome — and pipe plenty of heat into the building while they were at it. It is positively balmy once fans make it indoors. Martin Kessler of WBUR has spotted at least one fan in a tank top, another in shorts. It is unclear, though, how much warmth this, um, rather unconventional hardhat offers.